Gruyère is one of Switzerland’s most prized cheeses. Over there, they have all sorts of rules and regulations to follow when it comes to this centuries-old golden melter. In Wisconsin, our only gruyère rule: make it delicious. We love this semi-hard, winter warmer for everything from classic melty dishes like French onion soup and fondue to straight-up snacking in any form your little heart desires. Known for its excellent meltability, gruyere is also a snacking superstar. So serve it at room temperature and cube it, slice it, or put it on any cheese board next to any other cheese and it will be a stand out in any context. Big, rustic drinks pair well with gruyere. We like to think of them as ski lodge drinks – sturdy, warming and reviving to be enjoyed around a roaring fire. For beer pairings, we choose bock, Scotch and Belgian ales and pale ales or all types. For wines, try cabernet sauvignon, chianti, malbec, merlot, pinot noir and ruby or tawny port. We lean toward the brown spirits for gruyere, so bourbon…brandy... In Wisconsin, we are all about the brandy Old Fashioned but Manhattans are an excellent pairing choice. Classic European melted cheese dishes like French onion soup, Croque Monsieur, fondue, soufflés and gougères all love a tender and nutty gruyere. If you want to feature it on a cheese board -- who in their right mind wouldn’t? 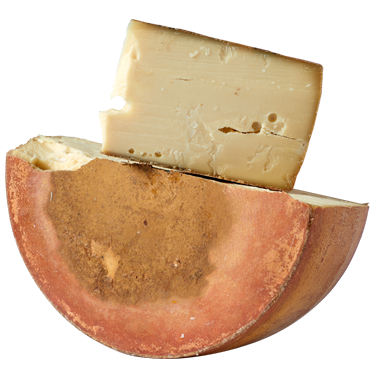 -- we recommend pairing gruyere with a bread that has a bit of sweetness and some freshly roasted and salted nuts.